This one is heartbreaking though at first I was confused by all of the players. Lippman does a great job of showing the consequences that Tess has to live with when she refuses to let a case go. Tess's family pays for it and it leaves her slightly estranged from her father. Considering that we never really got a sense that Tess's father was disapproving of what Tess did for a living, it was surprising to see him and Tess fighting in this one. In the end, the ending was very well done and I loved how Tess was about dealing with an eye for an eye (messing with her family does not go unpunished). 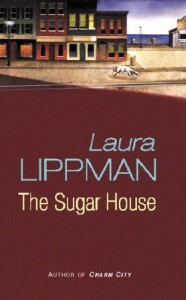 "The Sugar House" has Tess being asked to look into a murdered girl by one of Tess's father's friends. The woman who asks, Ruth, believes that her brother was set up to take the fall for a girl the police say he took back to his house and murdered. While in jail he was murdered, and Ruth wants someone to pay. Tess initially thinks this case is going to be one long dead end until she finds out enough clues to trace the unknown dead girl to a house for young teens who are dealing with eating disorders. As readers know, Tess dealt with an eating disorder when she was young, she also finds out her long time friend Whitney dealt with one as well. When Tess starts to find links between the dead girl and possibly some people that her father knows, that is when things go from bad to worse. We have the usual suspects in this one, Aunt Kitty, Jackie, Whitney, Uncle Spike and now we have Crow (he and Tess are trying again and are deliriously happy) and Tess's friends at the paper, along with her cop friend too. I do love how Tess is still haunted by the choices she made in book #1 and realizes she doesn't want to just look the other way again. She knows that some people did something terrible to this girl and it stings that her father is telling her to let it go and who cares. The writing was really good and I have to laugh at Whitney coming along as Tess's sidekick in this one. The flow was great and I maybe read this one too fast. I was so worried that something was going to happen to several characters in this one. The ending was great and it's nice to see that Tess is earning a good reputation as a private investigator.